How to passing array as parameter? How to declare a method to accept array as argument? How to pass array as parameter using C# programming? 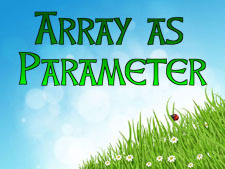 An array can also be passed to a method as argument or parameter. A method process the array and returns output. Passing array as parameter in C# is pretty easy as passing other value as a parameter. Just create a function that accepts an array as argument and then processes them. The following demonstration will help you to understand how to pass an array as an argument in C# programming. In the preceding example, we create an array and accept some integer value from the user at runtime. Then we passed array as argument to printarray(int newarray) for printing and other calculation. It is same as other value passed as parameter to the function. In this chapter you learned how to pass array as parameter to the function. In next chapter you will learn about some predefined array function in C#.